Ripley’s aquarium is my latest project in the works. 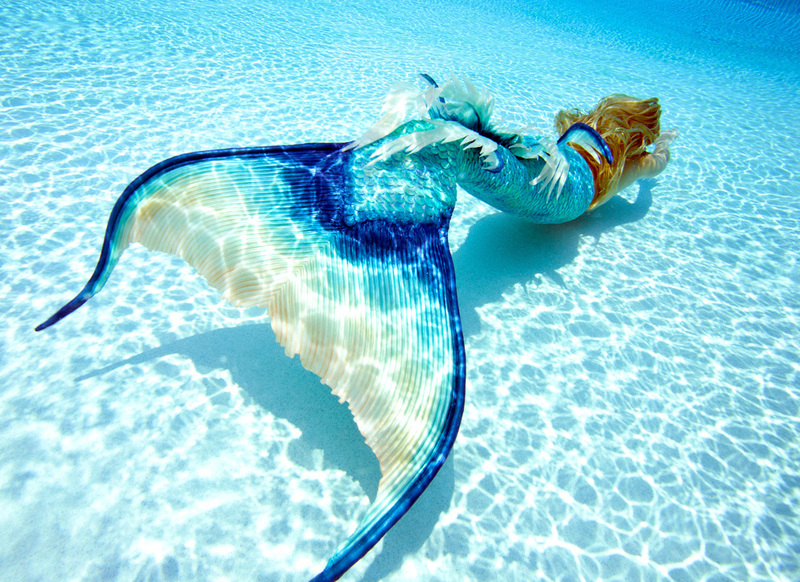 Working 7 days a week up to 4 shows a day, it is far from the typical mermaid job! For over 3 months this summer I will be completely dedicated to giving non stop high energy performances. It’s not easy building up the endurance needed to with stand the pressures of a deep 85,000 gallon saltwater lagoon! With an array of fish, sharks, stingrays, and a huge 6 foot bow mouth guitar fish that is over 220 pounds, it’s hard not to come face to face with these creatures often. Setting up the routines as lead mermaid was a physically demanding process! Rehearsals stated weeks earlier for preparations from both 3, 2, and eventually solo mermaid shows. Becoming a mermaid full time, also comes at a price that can be steep in doctor visits and dosing up on your vitamins, with tissues becoming your best friend. Shaking, light headed, saltwater draining from the nose, fatigue, loss of appetite, nose bleeds, soar throats, and muscle cramps, are just some of the things my body went through while fighting through the adjustment period of the shows. Doesn’t sound pretty but in order for athletes who train rigorously for their sports, so must I, -as an aquatic performer. Honing in on my underwater craft, I find new skills, more ways to push the boundaries of what we consider the norm for mermaid movements, and challenge myself to add something more or refine the movements that can always be sharper. Uprooting my life from family, friends, and my animals, was not an easy one… but, knowing what I was leaving them for, made the transition one that i welcomed! Forming a company with the brand of my name and becoming an LLC was just the beginning of so many projects I was taking on by myself all at once. There is no one to go to but myself to see things through and make sure it was all going as planned. The schedule changed often, the shows were ever evolving into something that worked better than the day before, and it took about 5 weeks to finally feel like we had found a system that worked for all involved. It was one of the toughest 5 weeks I have experienced physically and mentally, but when it finally clicked, everything was completely worth the blood, sweat and mermaid tears! 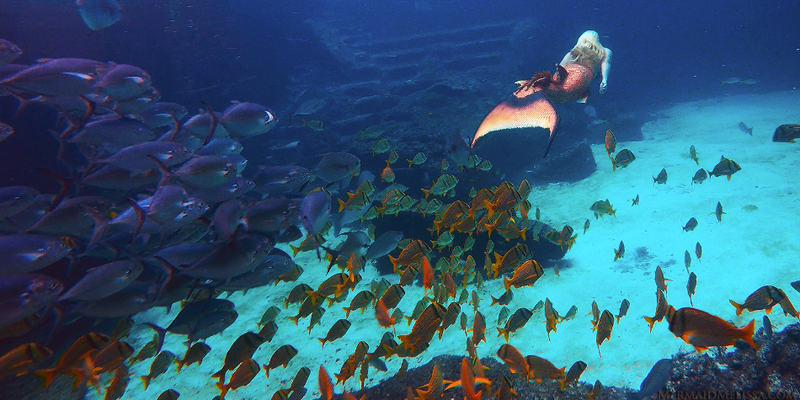 The shows were always full and after each performance, I got to meet with the guest in the shallows at the string ray petting pool that connects to the deeper lagoon. Receiving color drawings from children, hearing their very candid and honest opinions, and taking time with both adults and children who were excited to meet a mermaid, is truly what made it all worth it! Nothing made me happier than to hear people acknowledge the difficulty of swimming with such few breaths, flipping, spinning, and making it look easy with a smile on my face through out the show. It’s interesting part is that you want the perception to be that you are not strained during a performance because the goal is to make it look easy. Sometimes this can backfire though because everyone then believes the tails are easy to swim in… and though they are amazing mermaid tails, easy is not a word i would use when describing doing a long show in a huge 45 pound tail! It takes weeks of training to fully adjust to swimming properly in any tail especially the more advance and the more expensive, the harder the transition can be. Even with 7 years of professional jobs as an underwater performer, every day is a learning experience and a time to grow. There is no such thing as getting to good at something you do, and anyone who thinks they can’t improve on something they have mastered in life, i believe is holding themselves back from their true potential! I have learned that the higher you climb, the more you are watched, and not everyone will wish to see you reach the top… keeping focused on the things that really matter to you in life and sticking to your goals, is very important in not letting anyone drag you down. As my time at Ripley’s aquarium ends, there is so much more on the horizon that I have in store… This is truly just scratching the surface to my mermaid career and other future endeavors that I hope to accomplish in life. I owe a lot to so many for their love, support, and devotion from my family, friends, and amazing fans! Without all of you, none of this would feel as special, as so many wonderful people keep encouraging me and inspiring me to continue living my dream and never taking no as an answer.